These compact fluorescent spiral safety coated bulbs are brighter and whiter, in addition to being energy efficient. The safety coating protects and contains the glass if the lamp is broken. 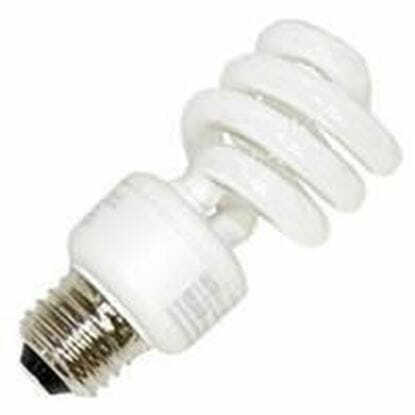 Safety coated products such as these coated spiral bulbs are required if the lamps are going to be used around food or in food preparation locations. They’re 13 to 40 watts with Xtrabrite color technology that brightens every area they’re in. These safety coated CFLs are guaranteed for one year. Available in 13, 26 or 40 watts, these medium based safety coated bulbs are 5000K, which produces a clean and modern bright white light that’s perfect for contemporary homes and business environments. Xtreme Duty™ means that they can withstand rugged everyday use and are especially reliable with a long lifespan. Since the coating on these bulbs helps to prevent contamination and injury that may result from glass fragments from accidental breakage, they’re used in sensitive locations where there is a high risk of breakage from hard contact. This may include public and school gymnasiums, storage closets, busy shipping facilities, cafeterias, kitchens, grocery stores, delicatessens, cafes, restaurants and food processing plants. Founded in 1974, MEBULBS is a leading provider of quality lighting products for the home, commercial and industrial markets. We offer our residential lighting products for cost-conscious homeowners and the more heavy-duty light commercial and Xtreme Duty lighting products for business and industrial use. These different product lines are offered so that our customers can choose the one that best suits their application and their budget. If you’re not sure what you need, our knowledgeable professionals will help you choose the lighting solution that meets your needs.